For this exercise, each person will have a partner that they will interview. Use a minimum of 3 objects during the interview. Each of you will ask the other about the objects that they brought and what they mean to them. It will be your job to come up with the questions for the interview, study the objects and think about what you want to learn about them. Use your interview to create a stop animation film using the objects in your interview. Students must use a camera that can take still images and has manual camera controls. Edit the audio and video so that the finished project is between 1-2 minutes. Stop motion is an animation technique that physically manipulates an object so that it appears to move on its own. The object is moved in small increments between individually photographed frames, creating the illusion of movement when the series of frames is played as a fast sequence. Frames per second or FPS is how many frames are shown within one second. 24 fps is important to film stop motion because it makes the film look smooth, where as if it was filmed in a lower standard e.g. 12 fps it would look jumpy and wouldn’t look as smooth as 24fps. The same with 48fps if a stop motion was filmed in 48fps it would look even more smooth and your brain would be working less to try and make the running of the film look good because the film is doing it already. For this Exercise, you can also use the speed/duration command to control the speed of your images during editing. There is no specific frame rate required, but try to use one that compliments the mood of your video. After you meet your partner, study the objects that they give to you for the interview (or arrange a time outside of class to meet). Come up with a series of questions that you want to ask them during a audio interview. 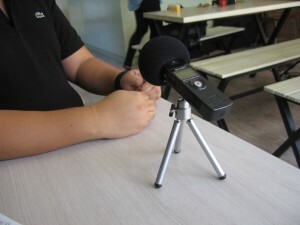 Use a recording device of your choice to collect the audio for their video project. When you are done recording, share the audio files with your partner. If you want to rent the equipment we used in class, reserve the ZOOM H1 Recorder from CSUSM Equipment Checkout. Import the audio from your partner into Premiere, review it and edit it down to a 1-2 min. cut. Remove the interviewer asking questions (unless you find it relevant for your story) and pull the most important parts of the audio together. Feel free to rearrange audio as needed. Use the Audio Mixer to adjust the levels of your audio. Play with different audio capabilities if time allows, i.e. layering music or multiple channels of audio. Use this edited audio to illustrate your stop motion story. 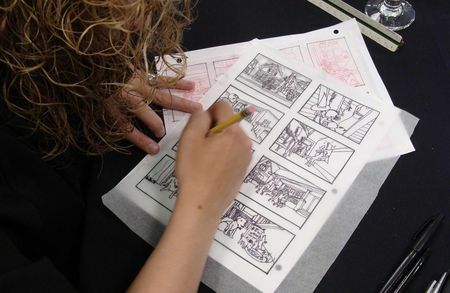 Use storyboarding as a tool to make sure you are varying your shots and that you have all the locations and props you need. Consider your last exercises and shots that you want to try, one that you thought you missed and others that compliment your current story. To consolidate your images into one video file, import your files as a image sequence. All the images for your stop motion must be in a separate folder and in numerical sequence.